Avenues Proper, a neighborhood gastro pub, had visions of expansion. They created not only a new microbrewery, but they also created a casual dining burger restaurant. They sought a cohesive brand program that spanned both entities. A dual purpose brand had to be created with enough personality to work on its own for each entity, but enough similarity to name each sister company feel like it came from the same mother. Unifying graphic elements were repurposed under each brand using color as the main differentiator. This allowed a very connected look between the two companies to build a connection in the eyes of the consumer. A logo system was created that kept Proper as the visual anchor of the three businesses. Typography treatment and composition kept all word marks in harmony while a secondary color was given to each of the entities to provide differentiation among the group. The watermark effect around the logo was adopted form the parent company Avenues Proper. It signifies what happens after a beer is enjoyed, the watermark. Additional variations of the logo were created to allow the identity system to adapt to various application requirements. 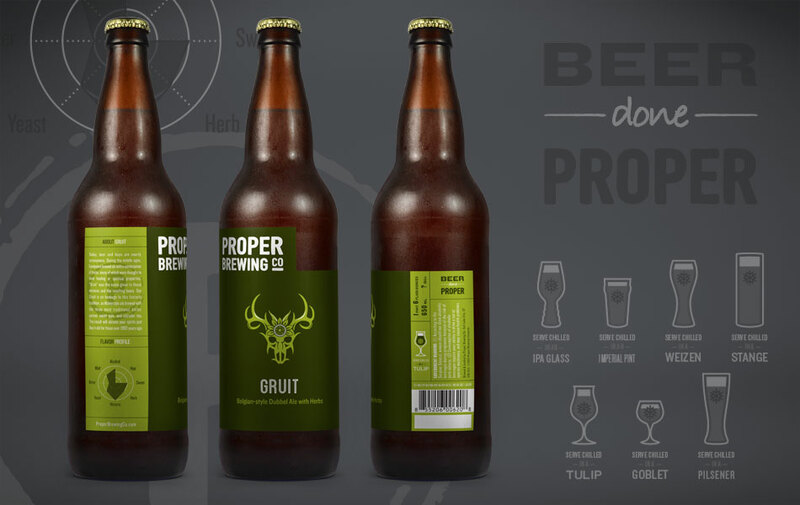 In their first year of business, Proper Brewing Co. created an astonishing number of brews. Each label had to speak to the concept behind each beer without sacrificing the presence and unity of the core branding. The labels were die cut to create the shape of Utah and connect it to local culture. A flavor profile graphic was designed to give consumers a sense of how the beer will taste and help them make the best selection for their taste among the vast collection of beer styles. Two buildings exist side by side on one lot. Two interconnected businesses running at the same time. Throw in Utah’s complicated liquor licensing laws and you are left with a very unusual experience. 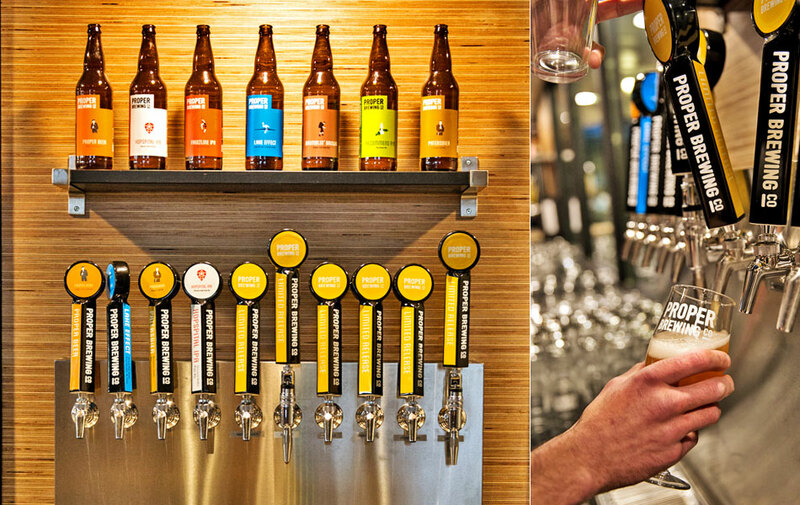 Buy beer on tap in one building, while you can only buy beer from bottles from the other. Forget about going from one building to the other if you aren’t finished with your beer either. This impacted design requirements to create a sense of destination and style for each building. We had to make each space have a slightly different feel to appeal to the general objective for the site visitor. The brewing company took on more of a darker bar feel while the burger company took on more of a brighter aesthetic. One focusing primarily on food and the other focusing primarily on the brews. Additional components were designed to extend the brand across multiple touchpoints.